After three scoreless periods, it didn’t seem as though either team would be able to break the 0-0 tied game as precious seconds ticked off the scoreboard in overtime at Apple Valley Ice Arena. That’s when the puck found its way onto the stick of a Burnsville forward in the Apple Valley zone. “When I looked down and someone got the puck in the slot and I saw it was (Cory Chapman), I knew it was going in,” Burnsville goaltender Chris Mallon said. “I was just thinking one shot could win it. Indeed it was the Blaze’s only shot in overtime and it was the only shot they needed as Burnsville senior forward Cory Chapman scored 5 minutes, 35 seconds into overtime to defeat South Suburban conference rival Apple Valley, 1-0, on Thursday, Feb. 9. With Chapman currently leading Burnsville in scoring with 47 points (20 goals, 27 assists), the Blaze bench rose to its feet when it saw who had the overtime chance. 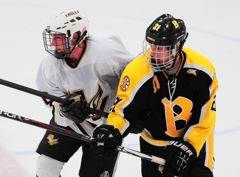 “He's a tough kid,” Burnsville coach Janne Kivihalme said of Chapman. “When he plays hard, he's going to get the puck to bounce his way. Today he got the bounces. Chapman’s game-winning goal gave Burnsville its third straight win and improved the Blaze’s record to 14-8-1 on the year. Despite Apple Valley’s tough season (10-9-2), Kivihalme knew the game wouldn’t be an easy one. “They're always (in it),” Kivihlame said about Apple Valley. “Coming closer to the playoff season, as any good team does they will get better and better. They played hard against us. They had a good game plan, they stuck to their game plan and gave them an opportunity to win. Chapman also knew the victory would need to be earned but quickly shifted focus to the Blaze's next opponent. "We just got to continue getting better," Kivihalme said. "We've got to learn from this game and keep getting better and get ready for our next opponent." 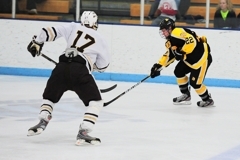 Burnsville will have one week to prepare for their next game and they'll likely make the most of that time as the Blaze travel to Eagan Ice Arena to take on the No. 4-ranked and South Suburban Conference leading Eagan on Thursday, Feb. 16, at 7:15 p.m.
Making 30 saves against Apple Valley and earning his first shutout of the season, Burnsville goaltender Chris Mallon couldn’t help but smile walking out of the visitor’s locker room at Apple Valley Ice Arena. Yet, despite his statistically perfect performance, the junior was quick to credit his teammates for the win. “Well the defense kept everything to the outside and made everything easy to see,” Mallon said. “I didn't have to compete with any screens and there weren't really any rebounds to worry about -- the defense cleared the pucks out. But surely this was purely humbleness and modesty. A shutout is a shutout. You would think that Mallon had to have at least been seeing the puck well in warm-ups. Burnsville coach Janne Kivihalme also praised the team’s total defensive effort. Still, the 1-0 victory was more the result of an excellent game by Mallon rather than the overtime game-winning goal by Cory Chapman. With a shutout finally under his belt, Mallon is already looking ahead towards the next challenge. “We just need to keep grinding out games if we have bad starts like we did today,” Mallon said. “We just need to keep fighting through it. After his team suffered a tough 1-0 overtime loss against Burnsville on Thursday, Feb. 9, Apple Valley coach Jerry Hayes spent several minutes talking to his players in the Eagles' locker room before taking some time to speak with the MN Hockey Hub about the game, the season and the play of his goaltender. Question: That was a pretty good hockey game to watch. What did you think about that one? Answer: It was a good hockey game. Two good hockey teams are both gearing up for playoffs. We're coming off kind of an embarrassing loss against Eagan (9-2 loss on Thursday, Feb. 2) and so we wanted to certainly respond to that and play a little better. And I thought tonight we did that against a very good Burnsville team. They're pretty big and strong and they're similar (size) to Eagan so we told our guys, 'last time we played against a big, strong team we got it handed to us. And we want to respond.' And I thought our kids did a nice job competing today and that was the big message; just compete and give yourself a chance. Q: Some have been surprised lately with Apple Valley surging back in the South Suburban Conference standings. How has this year gone for you and your team? A: We've been good all year. I really believe that. We've played some good teams -- obviously our schedule is what it is -- unfortunately we haven't won a lot of those games against some of the higher end teams. We've been close a number of times but we feel good about the group of guys. We have a great (locker) room, chemistry in the room, camaraderie in the room -- it's one of the best teams we've ever had as far as (chemistry). And when guys like each other, they're going to win hockey games and they're going to play hard and they're going to compete. I think we're seeing that. We had guys playing hard tonight and with that many seniors -- they're looking at the calendar too. They're saying, 'Hey, it's February. Man, I got like four or five games left and then I'm getting the baseball mitt out and this is it for me so I gotta kick it in now.' I think our seniors are starting to look at the calendar a little bit and recognize that time is short. Q: A solid, 25-save performance by your senior goaltender, Matt Koziy. Talk to me about his play tonight. A: Matt (Koziy) needed a game like that. Our goaltending has not been what we had hoped it to be and I think they'd be the first guys to admit that. They haven't played poorly, but they've been average high school goaltenders and with the schedule that we play and the teams that we play and who we're going to play in the playoffs -- even just the first round game -- you need good goaltending. I think Matt really responded well, answered the bell tonight and he played really well. Everything was in-control, he did a nice job with the shots, put everything where he wanted to put them, didn't give them a lot of second shots and had nice confidence. That was really good to see for us heading into the section playoffs. Cory Chapman scored 5 minutes, 35 seconds into overtime, lifting Burnsville to a 1-0 victory over Apple Valley on Thursday, Feb. 9. Mason Wyman assisted on the game-winning goal for the Blaze. In the hard-fought South Suburban Conference clash where defense ruled, both of the goaltenders were the highlight. Earning his first shutout of the season, junior netminder Chris Mallon finished with 30 saves in the overtime victory for the Blaze. In a solid performance, senior goaltender Matt Koziy made 25 saves for the Eagles. 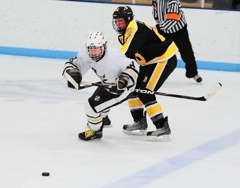 Next up for Apple Valley (10-9-2) is a trip to Hasse Arena to take on Lakeville South on Saturday, Feb. 11, at 3 p.m.
After its third straight win, Burnsville (14-8-1) will have a week to prepare for No. 4-ranked and South Suburban Conference leader, Eagan as the Blaze travel to Eagan Civic Arena on Thursday, Feb. 16, at 7:15 p.m. Without a big game from the junior goaltender, Apple Valley may have pulled off an 'upset' victory as the Eagles outshot Burnsville, 30-26. And Mallon stopped all 30 of those shots. Several coming at crucial moments -- Apple Valley power play, odd-man rushes -- as Mallon earned his first shutout this season. Just like his Burnsville counterpart, Koziy was a force in-between the pipes for the Eagles. Making 25 saves, the senior goaltender kept his team in a position to win until the very end. Though coming up just short, Koziy made a star performance. Scoring the game-winning goal in overtime is usually a good way to earn a game star. Getting the puck in the slot with a lot of room and just the goaltender to beat usually leads to good things for Chapman -- and Burnsville too. The senior forward ended the game 5 minutes, 35 seconds into overtime for his 47th point of the season (20 goals, 27 assists).